To create an environment that is both in harmony with nature and undeniably luxurious, Celebrity Cruises collaboration with Kelly Hoppen has not only brought her warm opulence to Celebrity Edge’s accommodation, including the suites and The Retreat, but also in the vision for The Spa. “The spa has always been a sacred space to me. “I always dreamt of designing my very own spa and Celebrity Edge proved to be the perfect outlet for living out my dreams,” said Hoppen. 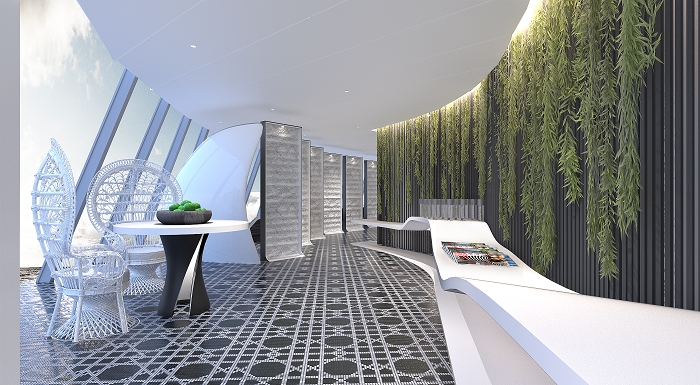 Celebrity Cruises infused natural elements into every moment of the experience at The Spa through an original concept called SEA – inspired by the Sea, Earth, and the Air – which transcends the design of The Spa and treatments. SEA unites every experience throughout the wellness journey. Bespoke blended essences fill the air, kick-starting the path to total relaxation. The Relaxation Lounge surrounds guests in a Zen-like ambience, clearing their mind before their treatments begin. Each treatment starts with a unique welcome ritual to prepare one’s mind, body, and spirit for the pampering to follow. Celebrity Cruises has teamed up with the leading authorities in their fields to harness cutting-edge technological and therapeutic innovations to create a spa experience unlike any other.